Scream 'til your daddy stops here. The Elvis Presley Memorial Combo. La Chihuahua Bar. Chuy's Children Giving to Children Parade. Burritos as big as yo' face. Shady Grove. World Famous T-Shirts. Chips & Salsa. Ball wall. Tex-Mex the way you like it. No crybabies. Creamy Jalapeño. The Miracle of '88. Blue corn tortillas. Air-conditioned dining. Hula Hut. Chicka-Chicka Boom-Boom. Chuy's Hot to Trot 5K & Kid K. Chuychanga. Hubcaps. 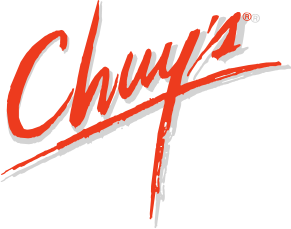 Chuy's Green Chile Festival. Mil Pescado. Elvis shrine. Chuy the Redfish. Lucy's Boatyard. Southwestern Enchiladas. Velvet paintings. Texas Martinis. Keep Austin Weird. We don't take anything seriously... except our food.